As much as I tried, I was never very good at drawing. That didn’t stop me from taking art classes all the way through school, hoping that one day something would ‘click’. The problem was, unlike many of my talented friends in art class, I had no style. There was absolutely no magic in my drawings. Tania Howells has got oodles of style. 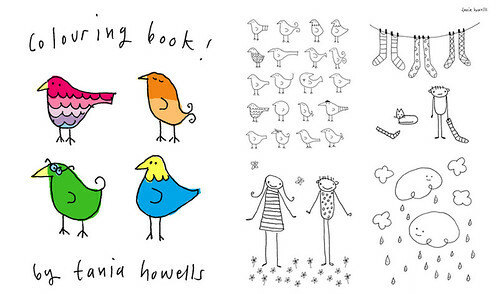 Her illustrations are fun, whimsical and overflowing with charm. I wish colouring books had been as cute as Tania’s when I was a kid. I may have to get one this weekend, so that I can pretend that I can draw. Tania’s first picture book is coming out this fall, called ‘Berkley’s Barn Owl Dance’. Whoo hoo! I have to know what happens at this owl dance. Did you always love to draw? Tania: I did- when i was a kid and friends would say “what should we do now?” I always wanted to draw, but we usually ended up doing lego. Is illustration something you went to school for? Tania: I went to Etobicoke School for the Arts in high school. Then I went to OCAD, but back when I went they had “interdisiplinary arts” which I don’t think they have anymore. It let me take all kinds of classes including wood, jewellery, ceramics, enamelling, metal, textiles. Mostly craft stuff and oddly no drawing or painting at all. At graduation, I was making mostly wooden shadow box scenes and hoped to use those as illustration work, but it all morphed into drawing as it was easier to market. What would be your dream illustration job/client? Tania: I have always wanted to work for Chronicle Books. They do such amazing projects. Are the characters you create based on people you know? Tania: Not really. Although some look like me. They are usually based on a small child in the way that each character will have an innocence and optimism that you tend to see in little kids. What’s your biggest influence right now? I just found out that Tania designed the logo for Buddha Dog on Roncesvalles, which makes me want to go there even more. I really really love hot dogs. If for some reason you miss out on Sunday, check out Tania’s etsy shop and pick up something to make you happy. this is such a nice little treat- thank -you Karyn!! Tania’s happy Buddha for Buddha Dog is a favourite image of the kids in Toronto and Prince Edward County. Even after three years I can’t look at our logo and help not smiling. Tania rocks! tania is such a talented gal! i love her work. tania – you’re welcome, it was totally my pleasure. andrew & krissy – i’m not surprised tania has so many loyal fans.